Review: Wordspionage – Word Games and Spies! There is no sound to speak of in the game, which I found odd – no clacks when you place the tiles, no wheel spin noises, nothing. [Note: The developer let me know that sounds are forthcoming in a future update!] The game board is black and white for the most part, with the exception of the multiplier tiles, which are blue, red, and green. The graphics for the Special Operations are well-done and crisp, and the interface is easy to get used to. As there isn’t really a plot in a board game, I’ll just tell you that the game is like Words with Friends or Scrabble, but with SPIES. The spy stuff is done through Special Operations, which cost Wordspionage Dollars (WS$) to initiate. Each new player is given WS$1,000 to start out with. You don’t have to play the game with them, but not using them takes away all the cool spy stuff and makes it pretty much regular Words with Friends. 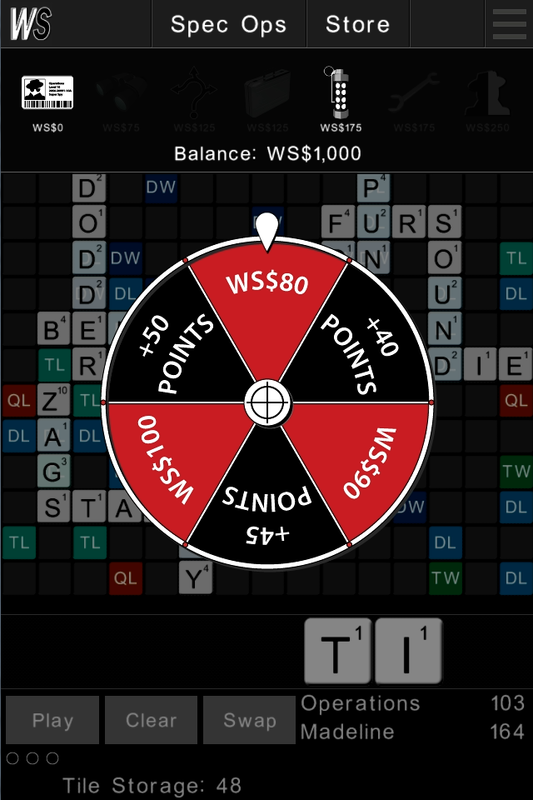 If you play mission words (randomly chosen four to six letter words), you can spin the bonus wheel to earn WS$ or extra game points. You can earn a spin by playing all seven letter tiles and winning games. WS$ are also purchasable for real money: WS$1,000 = $0.99; WS$3,500 = $2.99; WS$7,500 = $5.99. Here’s the cool spy stuff you can do! You level up by winning games and thus skill points. All players start as recruits and can level up all the way to a Special Agent. You can play a game with up to three other people at once. You can also set how long the other players have to take a turn; the game will automatically end if your opponent doesn’t take their turn in time. A decent game to check out if Words with Friends doesn’t cut it for you anymore and/or you want to spice things up. I also like that you can play with more than one person, something WWF doesn’t offer. It feels difficult to win a significant amount of WS$ without spending real money, especially if you’re not great at this kind of game, which is a shame. If you don’t want to make in-app purchases, the thing that makes the game unique is hindered. You can get the game in free and $1.99 versions on iOS as well as free and $1.99 versions on Android. System requirements for iOS are: requires iOS 5.1 or later, compatible with iPhone, iPad, and iPod touch, and optimized for iPhone 5.The only difference between the versions is lack of ads in the paid version. Check out the official website and follow the game and the team on Twitter. Thank you for the review, Kelsey!